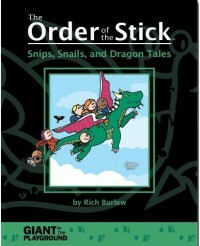 Snips, Snails, and Dragon Tails is more a curiosity than anything else. It collects all of the comics written for Dragon magazine before its demise, and like the previous two collections, nothing in those strips is required to understand the ongoing story in the Webcomic. Since there were only 30 of those strips, he padded out the rest of the book with some one-shot stories, one-page gag strips, and other content that don't really belong in the OotS canon. I liked a good bit of it, but what makes the Webcomic shine is his ongoing story, and the content in this book isn't really a part of it. Like On the Origin of PCs, I feel like this book is really aimed toward folks who can't get enough of the series (though his final strip for Dragon was kind-hearted and poignant).